Say what you like about the A-League, and in my Round 1 talking points I happily did just that, but two rounds into the season, the ability of this league to create topics to discuss continues unabated. Let’s get straight into the A-League (VAR-free Zone) talking points. Can we read anything into the crowds this season? The FFA loudly and happily trumpeted during the week that memberships for A-League clubs had passed the 100,000 mark, and at time of writing, 103,293 people have purchased memberships with the A-League team they support. Putting aside for a moment that the A-League has the same number of members as roughly one big AFL club (and I have no issue with that, let’s see how the A-League clubs are going after 100 years developing a following), but if 100,000 have signed up to their clubs, then why aren’t they all at games? Now, to be clear, I appreciate that not every single member should be expected to attend every single match every single round. But the numbers from this round, early in the season, make for some interesting reading. Adelaide managed only 7,906 to their match with Newcastle, a largely understandable turnout given there is little to no rivalry there, and I doubt Newcastle have the biggest secondary supporter base in South Australia, but in a city of 1 million, disappointing nonetheless. Central Coast managed 7,144 against Melbourne City, and that is something of a surprise when you consider the Central Coast are playing well (factoring in the Bolt effect), and Melbourne City are generally a good draw. The Sydney derby saw 30,588, which all things being considered is a good turn out, however, it is well short of the Melbourne derby’s Round 1 attendance, and gee it would have been nice to see a sold out SCG for its first ever A-League game. Remember, this is a fixture that would easily draw 60,000 at ANZ Stadium at the height of its popularity or sell-out Allianz Stadium. 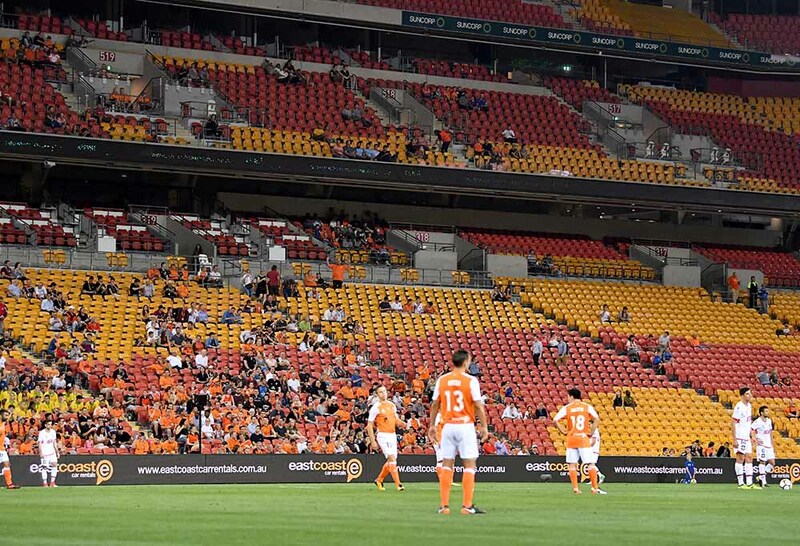 Brisbane hosted Wellington, again, another struggle for Australian crowds, however, the Roar administration should be very happy with their start to the season following a showing of 15,129. Finally, Melbourne had their first game of the season at AAMI, and the crowd turned out in numbers, as they always do (Melbourne Victory continue to show the way with a quarter of all members in the A-League, totaling 24,867) with a final figure 17,219. On the whole, two rounds into the season, those figures appear solid, right? The FFA should really be doing more to fix up those crowds at Gosford, Adelaide, and even Brisbane (why not 20 or 25,000? ), particularly when you think about how well other sports grab crowd attention in those regions in other codes. If not for Melbourne Victory and the two derbies to date doing more than their lion’s share of crowd-pulling, those crowd figures thus far can be vastly improved. To be fair, on the whole, there are one or two clubs who historically usually do the majority when it comes to crowd attendances. In particular Adelaide, they have historically shown a strong passion for their Adelaide Reds, regardless of the opposition, it surprises me that they do not draw a bare minimum 10,000 every home game, without a struggle. Central Coast too, while they are struggling for an identity that doesn’t involve a sprint-king marketing adventure, surely would be thinking they deserve 10,000 to 15,000 every week, given the exposure they have garnered and the better football they are playing this season compared to last. So far, Central Coast’s best attended game this season was Bolt’s pre-season friendly. Football, as a live spectacle, and on a global scale, sells itself on an atmosphere that is second to none. Watching the Sydney derby on Saturday night, I could see it’s possible in Australia, as the Cove sent out a TIFO for the ages, and throughout the game, the RBB bantered with their sky blue rivals. The crowds and the atmosphere are the biggest selling point of world football, so it’s imperative the FFA do everything in their power to create a game that demands attendance. 103,000 signed up members indicates there is a demand out there for the game, and the game has its following. Now, if we can just get them regularly attending games, the A-League might well be onto something. During season 2017/18, as a crestfallen Ernie Merrick faced the media after a 2-1 win over the Brisbane Roar, the only thoughts for that man at the time were with Ronnie Vargas, whose broken and dislocated ankle was being attended to in the nearby emergency ward in a Brisbane Hospital. It was potential career-ending stuff, and the distraught nature of Merrick at the time told a story of a coach who couldn’t even consider wins or losses, because the well-being of a player was paramount. It’s a credit to modern medicine, but also Vargas’ personal drive, that not only did he walk again, he came back to contribute last season, and played in a grand final. But Vargas was never quite fit when he came back last season and relied entirely on his wits and skill to remain an important part of the Jets’ run to the Grand Final. With a full off-season under his belt and blowing out the cobwebs against the Phoenix in round 1, Vargas played a belter against Adelaide and managed to score his first ever A-League goal to boot. The Jets lost some good personnel from last season, but it appears that having a fully fit Vargas in the line up may well be just as good as having a new signing. Here’s hoping for the Jets and the A-League that he can stay fit for the full season. Mike Mulvey can coach, remember? It’s easy to forget Mike Mulvey is a championship winning coach. When talk goes back to the Brisbane Roar’s halcyon days of winning championships and unbeaten streaks, the coach at the centre of that talk, is rightly Ange Postecoglou. But when Ange left, Mike Mulvey came in. After a season of re-adjustment, he led the Brisbane team to its third title in four seasons, and his ignominious departure from Brisbane belied his ability. I have no doubt, as Mulvey sat back and watched his new squad being dismantled by the Newcastle Jets 8-2 in the final round last season, that Mulvey thought to himself he would have to draw on every instance of experience from his championship-winning ways. Then Usain Bolt came along. The Mariners find themselves winless after two rounds, but equally undefeated. 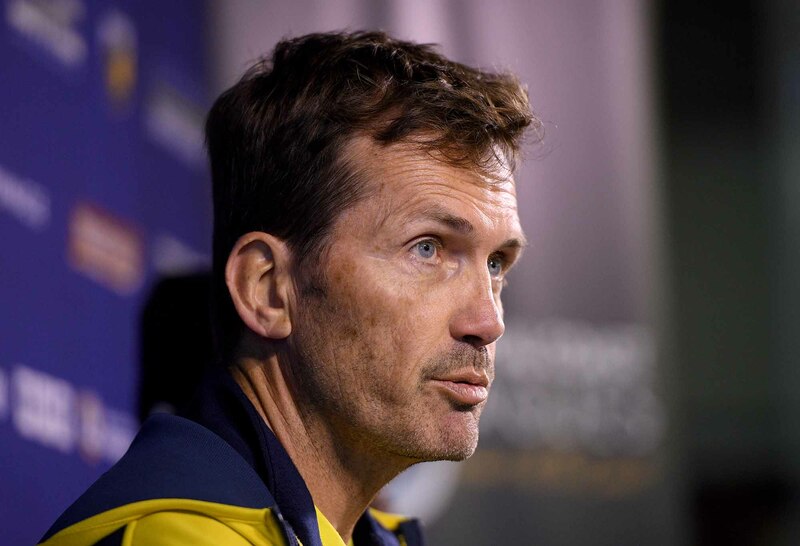 They likely deserved more against Brisbane and definitely deserved the full three points against Melbourne, so Mulvey will be telling his squad that the three points are definitely there for the taking against an equally unbeaten, but winless, Adelaide United. But performance is all relative, so for a side that was stone motherless last at the end of season 2017/18, the Mariners have started this season brightly, and the season’s prospects look brighter still. Mike Mulvey can give himself an early season pat on the back. A lot of talent left Sydney during the off-season. They lost 20+ goals with the departure of Bobo. Adrian Mierzjewski also left Australian shores, so there is another 10+ goals. And just for good measure, stand-out defender and attacking option Jordi Buijs was not kept on. For first-year coach Steve Corica, following in the giant footsteps of Graham Arnold, the loss of that much talent could be panic-inducing, enough to keep a young coach up at night with the coldest of cold sweats. But for all the talent that left, and to be sure, Sydney brought in apparently ample replacements in Adam le Fondre, Jop Van der Linden, and Siem de Jong, one player, in particular, hung around. Milos Ninkovic is a star player, and his quality has never wavered during his time in the sky blue jersey. Other stars come and go, and while it has been easy to over-look Ninkovic’s contribution in the face of Bobo’s goal hauls, or Adrian’s biceps, Milos kept contributing to his Sydney team, becoming a mainstay and crucial element to his team, so much so that while others left, he was kept on. And boy oh boy was he magnificent in the derby on Saturday. His link up and lead up play was immaculate, and he looked so comfortable with Le Fondre and Alex Brosque, at times, you felt that Sydney were going to score six or seven goals in the first half alone. It was Ninkovic’s through ball that set up Alex Brosque for the second goal, and it was pinpoint to the point of perfection. With a fully fit de Jong, Sydney may once again go on a rampage to yet another title. 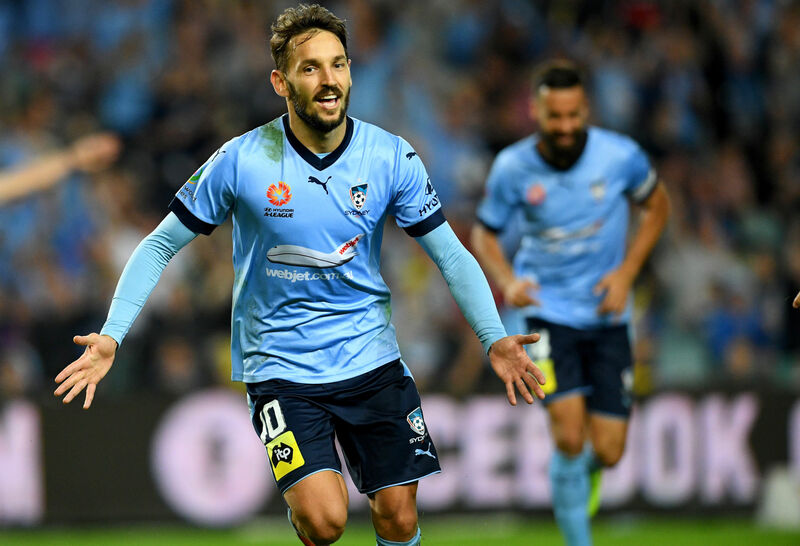 On Saturday, Ninkovic continued to remind anyone that had forgotten just how important he is to Sydney FC, and indeed, the A-League. In a game that centred around a VAR decision, not even that controversy can detract from how good Ninkovic was. Well, it’s early in the season, but it’s never too early to start handing out awards, particularly when a performance comes up that nobody is going to top. And with that in mind, the “Fernando Torres Award” for miss of the season was wrapped up for season 2018/19 with aplomb, and the type of miss that you have to watch a bare minimum 20 times before you finally believe what you have seen. Now, I won’t lie, before this match, I hadn’t actually heard of Steven Taylor. I was not aware that he played 200 games for Newcastle United, had no idea he was English. I didn’t even know he was in the A-League. But now I do, and what a way to introduce yourself to the masses. Taylor cannot have been anymore than six yards away from goal when he found the ball at his feet and an empty net in front of him. In fact, he was no more than three yards, because he was clearly well inside the six-yard box. As the ball bobbled from Jamie Young’s out-stretched hand, Taylor’s eyes must have lit up in a way he hadn’t experienced since the last time he’d won promotion with United. That side foot was near perfect if only the goal post was a mere further six inches to the right. Instead of finding empty net, Taylor hit all post. Given Wellington were after the chance to go solely on top of the table, and the match finished a scoreless draw, Taylor could have been hero, but literally ended up the zero. Going the reverse Riley McGree, instead of goal of the year contender, Taylor sealed miss of the year contender, and I would imagine, in this day and age, the fan vote will land clearly in the Englishman’s favour. Never take scoring goals for granted, because it’s not easy. Kenny Lowe, it has to be said, was a good coach. A great coach? Unlikely, though there is the argument in his favour, but a good coach he was. Though, while he was a good coach, another thing he had become, was stale. After all those years in Perth, and the salary cap saga to boot, it’s actually a wonder he lasted as long as he did. It was clear at the end of last season that his time had, mutually, come to an end. The proof is in the pudding on whether Perth needed a new coach. Tony Popovic has added a new style, discipline, and cohesion to the Perth outfit that was missing from the sometimes erratic, and certainly volatile, Kenny. What Poppa brings to Perth is calm, assurance, and an even-head that has been missing from Perth for too long. 2 rounds into this new season, the Perth pudding is looking quite tasty. As for Melbourne? Well, they have a dual championship-winning coach, so there’s no concern there. At least, not yet, despite being winless after 2 rounds and bottom of the table. Melbourne Victory didn’t win a game for 4 rounds last season, and that seemed to work out for them in the end. But when you have a new defensive linchpin in Neidermeier, you’d hope that you’re going to be cleaner at the back then Victory were in the first half, conceding the two easy goals that they did. Two coaches – one temperamentally chalk to the other’s cheese. What a difference each makes.